Maybe you’ve just recently started writing content for blogs or perhaps you’ve joined a copywriting agency. In such a scenario, you must be eager to improve and expand your writing skills. One of the greatest favors you can do to yourself is to understand that you can never completely perfect your writing, as it is a constant process of self-improvement. One of the most important aspects of writing, which should never be compromised upon, is your grammar. Your grammar while writing for an audience is much more important than you think. Lack of good grammar can take away the focus form your words and content, instantly reducing its quality. Now you might think that your personal editing and proofreading skills are good enough for you to be able to adequately fix your spelling and grammatical errors. The truth is, however, that even the most famous and most accomplished of writers hire professional editors and proofreaders to double, and even triple check their content. But of course, you can’t go on spending a fortune on editors and proofreaders and that is why we suggest the next best thing that is suitable for both, amateur bloggers and content writers. A well-reputed and reliable grammar checker tool can be a trusted tool for checking and detecting the slightest of errors within your content that failed to catch your attention. Here are some of the many reasons why grammar is so important. When talking to a person with bad or incorrect grammar, or even someone that does not spell properly, it instantly influences our opinion of their competence. In our professional dealings throughout the day, spelling and grammar are important factors that enable us to form our perceptions and opinions of the people we interact with. If you see an advert for an exciting new product with bad grammar or spelling, it would instantly make you lose interest in that product completely. While Google has never openly or clearly admitted to it, grammar and correct spelling is also an important factor in SEO and page rankings. Matt Cutts, former head of the webspam team at Google, very clearly said that he has noticed how the ability to spell correlates well with a website’s ranking. Reputable sites and pages have error-free content while websites with lower rankings are often the ones that have content full of spelling and grammatical errors. This makes it quite clear that spelling and grammar directly or indirectly do influence a page’s ranking in the search engine results. Another reason to take spelling and grammar seriously is formal writing. In business and your professional dealings, you do not have the liberty of communicating with bad grammar or incorrect spelling. Content writers, especially, are often required by their clients to write content that is free from all errors and plagiarism. And while you might be quite the expert in proofreading your own documents yourself, a mistake or two can go unnoticed sometimes. Contrarily, you might not be aware of the mistake you’ve made, and it might not even get pointed out by MS Word’s spell check. A grammar and spell checker solves all these issues for you. There are a huge number of grammar checking tools available on the Internet, each offering their distinct features and price plans. And while you might not be so sure about whether or not you need such a tool in your life, you will be glad you made the decision of getting one when you finally do. We have reviewed each of the seven tools on this list in detail and have touched upon their best features as well as their shortcomings. Each grammar checker has been evaluated and assessed based on the levels of accuracy, ease of use, performance, and value for money that they offer in their paid versions. Customer support is also an important factor that we have taken into consideration, and that is why grammar checking tools with higher customer satisfaction rates and better customer support have also ranked higher on this list. 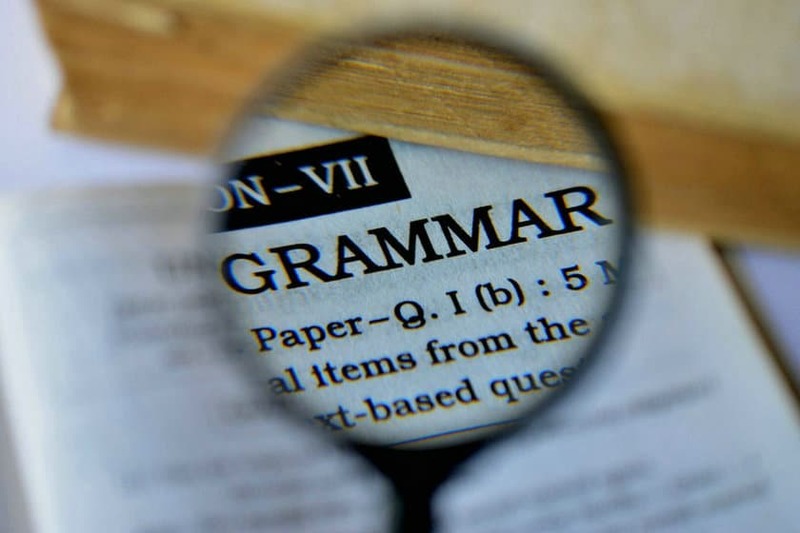 Before we head onto our detailed list of the seven best grammar checker tools, here are some tips and thoughts on how you can make the right choice when you finally decide to get a grammar-checking tool for your use. Every tool on our compiled list will offer different features and functionalities. Some have both free and paid versions, while others don’t have a non-paid version, to begin with. Depending on your use, you might be satisfied with a computer only tool, or maybe you will need a browser extension and a mobile app as well. While some tools on this list won’t be as thorough with their checking, others will offer much more detailed grammar and spelling correction capabilities. If you only want to get rid of typos and grammatical errors in official emails and formal documents you might make from time to time, then the lower-end grammar tools or the free versions of most tools will be good enough for you. However, if writing makes up an important part of your job or the importance of error-free content is much higher for you as a professional, then don’t be afraid to dish out a few dollars a month for a paid plan or subscription. The higher level of precision and accuracy, as well as advanced features, offered in the paid versions of these tools, will significantly improve the quality of your work and writings. Professional content writers, for example, rely heavily on what they write for their earnings. 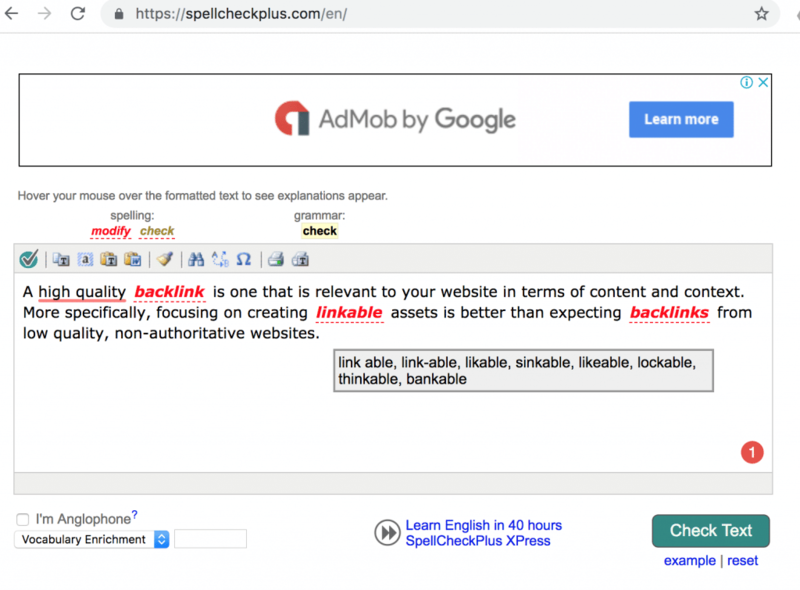 Paying a few dollars a month will not only improve the quality of their content but also allow them to use additional tools like plagiarism checkers that come with it. Grammarly isn’t just one of the most popular grammar checking tools today, it is one of the very best! 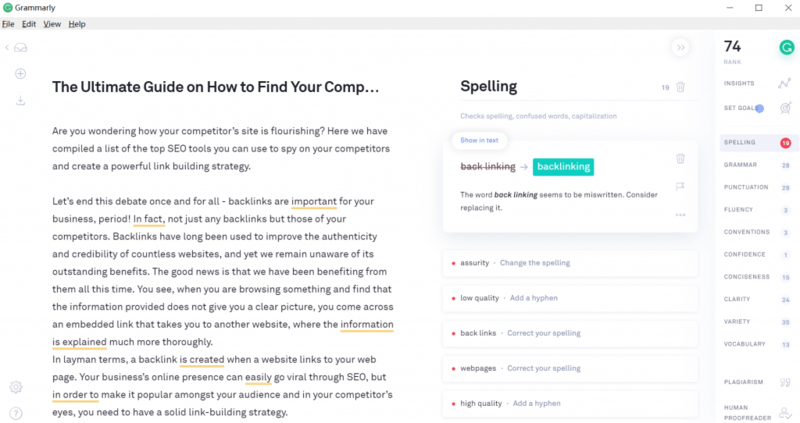 A great marketing campaign and a better set of features and offerings have quickly made Grammarly the preferred grammar checker of choice for many. Easy to use and easier to get started with, Grammarly works well online and will automatically check your text for errors once you’ve incorporated its extension into your browser. There is a free version that works quite well, detecting and correcting over 150 types of different errors. Grammarly’s online text editor can be used to either write text directly or copy and paste the text you’ve already written into it to let the grammar checking tool do its magic. The paid version will cost you around $30 per month and will check for over 250 types of grammatical errors. 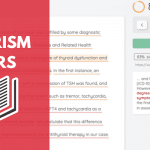 Other great features in the paid version include plagiarism detection and citation suggestions. Grammarly is, without a doubt, one of the best grammar checking tools you can get your hands on. Its free version will meet most of your needs and the browser extension works very well for everything you type online. However, once you’ve signed up for the free version of Grammarly, the service constantly reminds you and wants you to upgrade to the premium version. It will remind you of all the features you’re missing out on and even hint that there is much more wrong with what you’ve written that can be corrected by the premium version. While those claims might not be false, they are a little bothersome, which is why we recommend upgrading to Grammarly premium if possible. Ginger is another excellent grammar checking tool that you can also get for free and start trying out right now. It is quite easy to install and run, so you shouldn’t have a problem with trying it out and seeing if it works well enough for you. Although it catches much fewer errors compared to Grammarly, it is still a good and solid choice for most users. Apart from the software, Ginger also works online, and you can use the service to correct any text or written content that you think needs checking. Apart from detecting mistakes and spelling errors, Ginger also examines the context of the mistake to make the best possible suggestion to you. Ginger is one of the easiest to install grammar checking tools you will find. Its free version can be downloaded and installed very easily and quickly. It does a great job of detecting syntax errors and even claims to examine context before making suggestions. However, the suggestions made by the tool aren’t always perfect. Browser extensions and mobile versions are only available for paid versions. Number two on our list is WhiteSmoke, another great grammar checking tool. If Grammarly was too pricey for you, WhiteSmoke solves that problem by being comparatively cheaper. It offers one of the easiest to use interface with a clean and uncluttered design. It is nowhere near as good as Grammarly, but WhiteSmoke will check syntax and spelling for you in real time. Its online performance isn’t as good as Grammarly, but it still gets the job done. WhiteSmoke does not have a free version, however, and only allows you to choose from three different paid plans according to your needs and requirements. While WhiteSmoke does offer much lower rates, it does not offer a free version. The lower price also comes at the cost of lower performance and accuracy. It will often detect a lot of errors but fail to provide accurate and good enough suggestions for all of the errors it has detected. It isn’t a tool you can blindly trust to correct your writing. 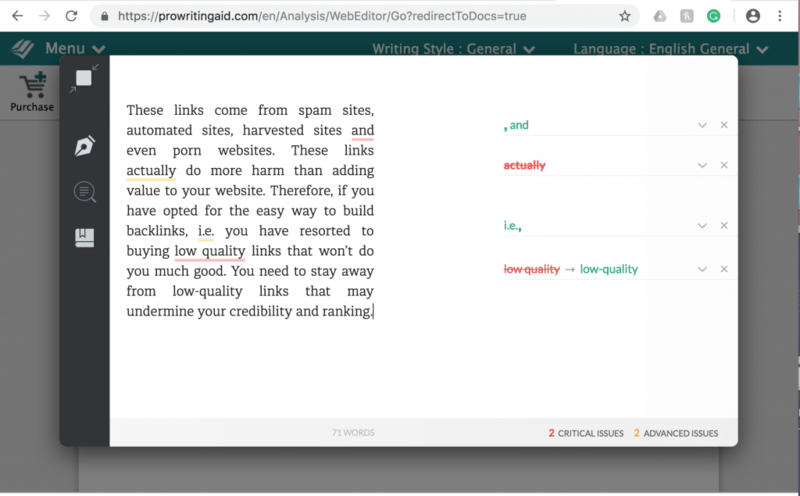 ProWritingAid is a grammar-checking tool that goes beyond normal grammatical mistakes and correction capabilities to even detect and point out structural flaws in your writing. This makes it one of the best tools for students and people learning to write better. The software is one of the best at finding problematic repetitions in sentences. It does a great job of correcting some of the most common problems in writing structures and also provides users with substantial feedback to help them fix their mistakes. Once the tool has highlighted the areas with errors or room for improvement, you can simply go and fix those errors. Here you’ll also find a text search field that will let you look up definitions and synonyms for words to help you apply the best possible fixes to your writing. ProWritingAid offers a free version as well as a premium and premium+ version. The free version has its limitations, as it can only be used online and there is a limit to edit only 500 words at a time. The premium version offers integrations for Word, Chrome, and Scrivener, which the free version does not. The tool also isn’t the best at detecting punctuation issues. As the name already suggests, LanguageTool can detect and fix grammatical errors in several different languages. It can perform spell checks as well as grammar checks and then highlight the areas that need improvement. The highlighted areas can then be clicked for more information on the error and what you can do to fix it. LanguageTool does a sufficiently good job of detecting and fixing errors, but its most impressive feat is that it does so in multiple languages. Different types of errors are highlighted in different colors. All in all, LanguageTool does a decent job at fixing your errors. Its paid versions offer more features and remove any limitations associated with the free version. The option of 25+ languages is an incredible feature that makes LanguageTool one of the best tools there is for grammar and spelling correction in multiple languages. It is available for desktop but does not offer support for mobile or browser extensions. One of the cheapest available options, SpellCheckPlus Pro is the premium version of the online grammar-checking tool, SpellCheckPlus. The tool does a decent job of detecting various types of errors in your writings. It is an online-only grammar checking tool, however, which means that you have to copy and paste your content into the online tool and then let it analyze your text for errors. The pro version does several things better than its free version. It offers suggestions for the detected errors, removes ads, and lets you input as much text as you want, compared to the free version that will only check 2000 characters for you at a time. It also increases the workspace size and lets you maximize the editor and online grammar checker to the size of your browser window. Individual license currently costs $15 and the site claims that more features will be introduced into the pro version as well. SpellCheckPlus Pro seems to be lacking in a number of areas. Its pro version is still behind the free versions of the other grammar checking tools we’ve mentioned on this list. The online tool doesn’t retain the original formatting of the document when you paste it into the online editor, which can cause more problems than it fixes. Hemingway App is quite an extraordinary grammar checking tool. It is an online service as well as a desktop app that can analyze your writing skills and assess the readability level of what you’ve written. After analyzing your written text, the tool provides you with a readability score, which describes the clarity of your text and how readable it is. The higher the rating you get, the easier your document will be to understand for the readers. This is an ideal tool for writers that want to improve the readability of their content. The free version is available online and works quite well. You can purchase a lifetime membership in around $19. What you need to keep in mind about Hemingway is that it isn’t your average grammar-checking tool. It focuses on the readability of your content and your writing style. Editing the highlighted areas can be as quick as click and fix, or applying your own corrections to the errors. Hemingway does not, however, fix grammar or spelling errors, it only helps improve the readability, clarity, and overall writing style. Each of the seven tools mentioned on this list has their own unique set of offerings. While some of these might be lacking in some areas, they make up for it where their counterparts fall behind. The purpose of providing a detailed assessment of the features as well as the pros and cons of each tool has been to enable you to assess your own needs and make the choice that suits you best. An option easier on your pocket might not be good enough to detect all the errors and mistakes if you write technical content or something complex. On the other hand, a tool may be offering great features and support but might also be too expensive for you to afford. Therefore, we suggest that you take your time and go through each of the features mentioned on this list. By weighing the pros and cons and value for money provided by each tool, you will be able to make the right choice depending on your particular writing needs.